Feet: If you are having a beach wedding, then offer a Shoe Valet. It lets your guests trade their shoes for sandals or flip-flops. Also, offer a de-sanding station for them to wipe off the sand after the ceremony. Eyes: Beach Weddings usually take place on a sunny day, which can be blinding for some people. So, let everyone know they better bring sunglasses, hats or whatever protection from the sun they can think of. Weather: Remind your guests they should bring appropriate wraps, it will help them if the weather becomes cold. So, let them know they should have sweaters, shawls, sweatshirts, or blankets on hand. If the weather is warm, then offer cool drinks, paper towels, paper fans and accommodate your guests the best you can. Every wedding tends to have a dress code, and everyone has to oblige to this code. Even the bride, she has to select from the beach wedding dresses to accommodate the laid back beach theme. Beach weddings are not the venue of formal wear. You have to go according to the coastal mood with light fabrics including sheer silks and chiffons. These things have a nice fluid movement while looking too dressy. If you have a platform set up, then you have to use stain pumps. Otherwise, you are better off with sandals. Some brides even choose to go barefoot! Don’t stress on makeup, be free-spirited. Just mind the breeze because it will stick your hair strands in your teeth or lip gloss. Select a wedding style that doesn’t have hair in your face, loosely arrange your hair, and you will be fine. Crashing surfs help create an atmosphere, but they are noisy, so make sure you have a microphone for your officiant. If the setting is picturesque, you won’t have to spend much on décor. Get an Arch to make a pretty focal point. You can easily rent one, but your venue coordinator should be able to guide you here. Don’t forget, most beach sites are public. For privacy, you will need to book your wedding at a venue that offers a private beach. 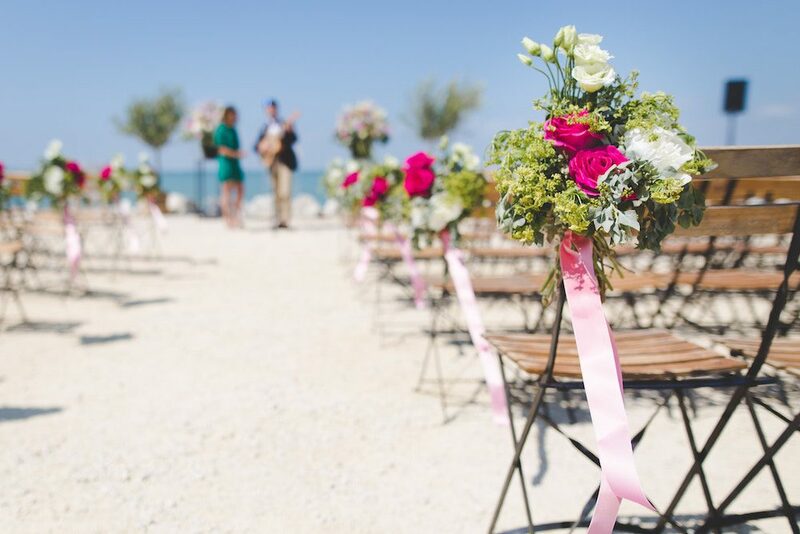 Do you want to have a beach wedding? Let us know in the comments below!